In an effort to generate more awareness to the other near-by towns, Jan approached one mother from ASP Bacoor Chapter to lead a new chapter. “I saw a potential leader in her,” said Jan of Ms. Jacqueline Garcia. 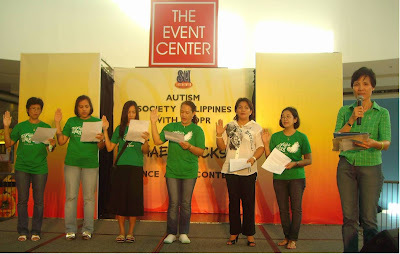 Jacqueline (Jacky) Garcia is also serving as ASP Board of Trustee from May 16, 2009 until October 24, 2009. “From 10 original members, there are now 23 members,” said Jacky. She visited the office on September 9, to give the update. The following mothers were inducted officially to office: Jacqueline C. Garcia- President, Gina J. Sarmiento-Vice President, Aileen U. Ramos- Secretary, Jocelyn D. Elisan-Treasurer, Veronica I. Bambilla- P.R.O (English); Mrs. Eloisa S. Manabat- P.R.O (Tagalog); Ellen D.Telan-Auditor and Evangeline P. Detera- Chapter adviser. Are you looking for a Family Support Group in the Cavite Area? Call 0920-8247636 (Jan) or 0929-7623178 (Jacqueline) for more information.